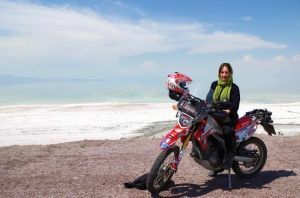 Long-distance motorcyclist Steph Jeavons is almost half way through an ambitious solo navigation of the globe, which she is tackling aboard her trusty Honda CRF250L nicknamed Rhonda. Dubbed “One Steph Beyond”, the trip began in March this year and will see Steph travel through 42 countries in two years as she raises funds for the charity Rally 4 Life. Currently on a short hiatus in Thailand, Steph is 14,000 miles into her journey with 24,000 miles still to go and, upon completion of the trip, could become the first female motorcyclist to travel through all seven continents solo. Steph’s ambitious round-the-world trip is certainly proving that the Honda CRF250L lives up to its description and she is so far more than satisfied with the its performance. For more information on the Honda CRF250L, visit wwww.honda.co.uk or contact your nearest Honda dealer.